Carrot Mash Recipe with Fresh Ginger | Simple. Tasty. Good. 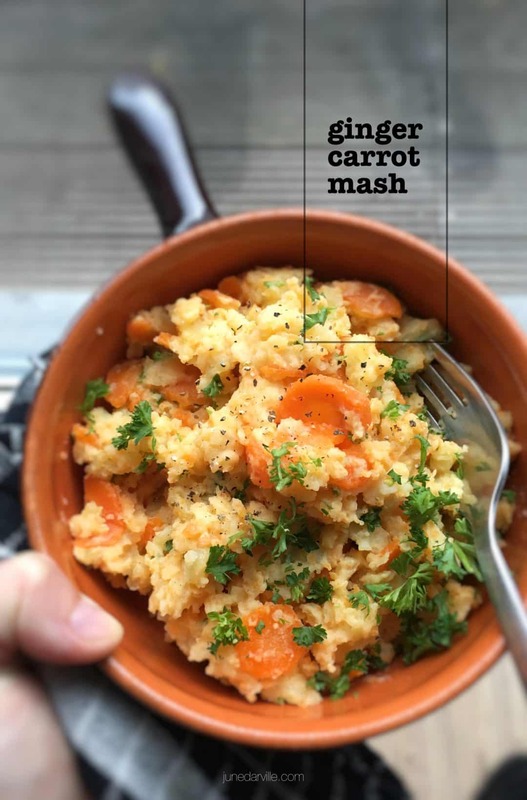 Well now, the grated ginger in this carrot mash recipe really makes the dish! It takes an everyday tasty bowl of creamy carrot and potato mash a few levels higher, that I can guarantee you. I love potatoes. Pretty much all of our dinners contain potatoes. But since plain boiled potatoes get a little boring after a while, I am always in for a new potato side dish idea. Vegetable potato mash is a creative side. Of one my favorite ones is my potato mash with caramelized onion. Are you fond of olives? Then do check my mashed potatoes with green olives! That’s a surprising combo, and a great side dish for chicken or fish. Not fond of vegetables? Then try to mash some steamed cauliflower with your cooked potatoes. You won’t hardly taste anything and once mashed, the cauliflower and potatoes look very much alike. I sometimes mash up steamed cauliflower without even adding potatoes. True, taste will be totally different but it really looks almost the same. I love cauliflower mash with chicken saltimbocca! Once made that for my neighbours and they loved it. 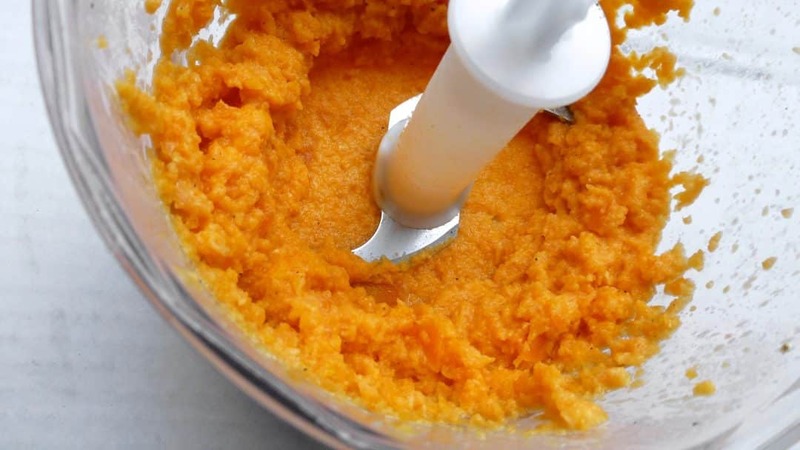 I made this ginger and carrot mash recipe twice: first time on the stove and a second time I mashed all the cooked ingredients up in my KitchenAid Stand Mixer Mini. For the last recipe, scroll down to the second recipe on this page! Also watch my video of how I’m preparing my savory carrot and ginger potato mash recipe in my fabulous KitchenAid Stand Mixer Mini! My god, what a fantastic flavor kick the ginger adds! You should really try it. I’m sure you will love it. There’s no way I could fully describe that wonderful zesty, almost peppery ginger aroma. 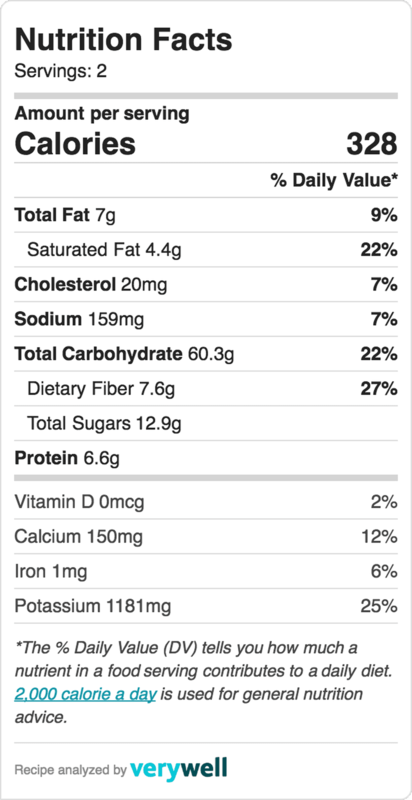 Ginger is a great match for the carrots. I blended half of the carrots into a puree and stirred them into the mashed potatoes. I really wanted that carrot flavor in the background. The sliced carrots are there for texture and a bit of crunch. I served this ginger and carrot mash as a side dish for a couple of sausages in a scrumptious onion and Guinness gravy… Needless to say that this dinner was a great success. Definitely worth trying out! 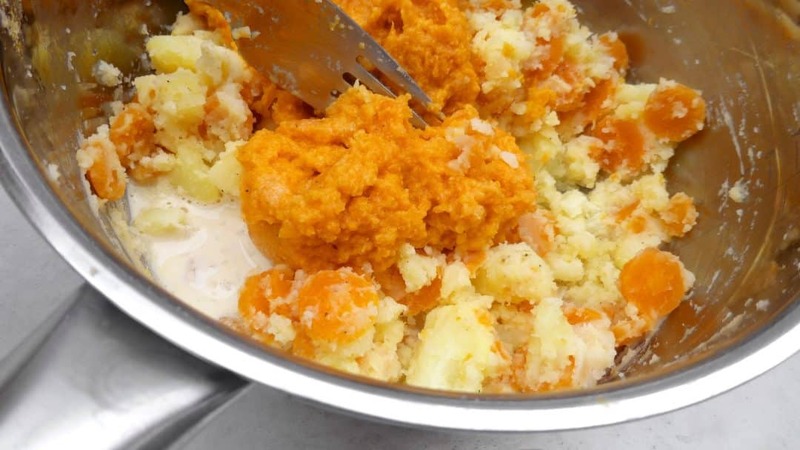 Creamy, chunky and zesty… you will adore this ginger and carrot mash recipe! Great in combination with sausages and onion gravy. 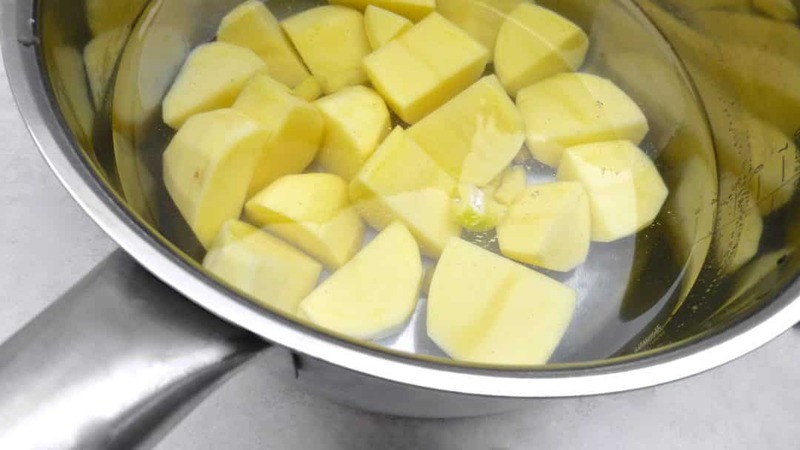 Fill a large saucepan with water and add a dash of salt. Place the pan over high heat until boiling. Then add the garlic and potatoes. Turn the heat lower and cook the potatoes for about 20 minutes. In the meantime peel and trim the carrots. Slice them up. 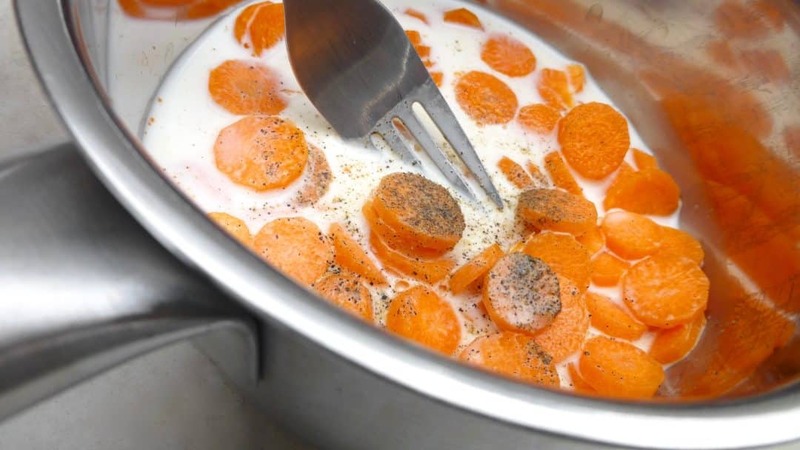 Add half of the sliced carrots to a medium saucepan and add the milk. Season it with pepper, nutmeg and salt. Bring the carrots and milk to a gentle simmer and cook for about 8 minutes until soft. Remove the cooked carrots (keep the milk aside for later) using a slotted spoon and add them to a blender. Also add the grated ginger and a pinch of pepper, nutmeg and salt. Blend into a fine puree. 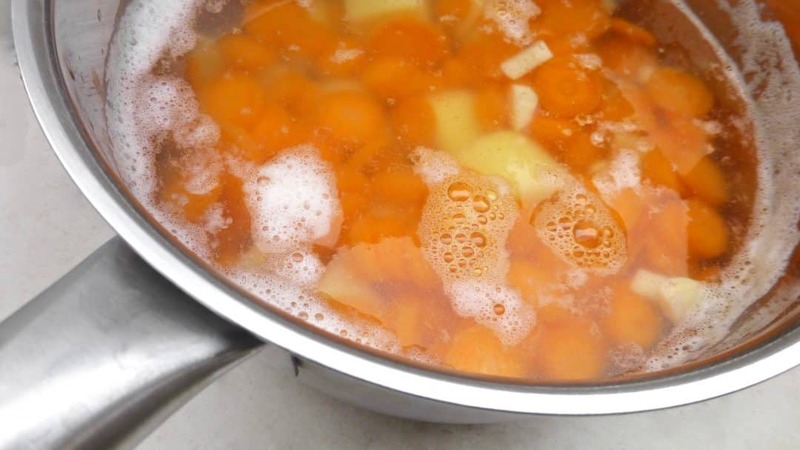 Add the remaining sliced carrots to the boiling potatoes 5 minutes before the end of cooking time. Then drain the cooked carrots and potatoes. Transfer them to the same pan again. Add the butter and season with a little pinch of pepper, nutmeg and salt. Mash them up a little. Then add the blended carrot and ginger puree and a splash of the warm carrot milk you kept aside earlier on. Stir the carrot mash well. Add more milk if you like. Then check the seasoning and add extra pepper, salt, nutmeg or butter if necessary. Scoop the carrot mash onto warm plates and serve hot. OK so here is the KitchenAid Stand Mixer Mini method for the ginger and carrot mash recipe! The beginning of the recipe is quite the same, in the end the stand mixer will do all the mashing for you. Creamy, chunky and zesty… you will adore this ginger and carrot mash recipe! Great in combination with sausages and onion gravy. Enjoy! 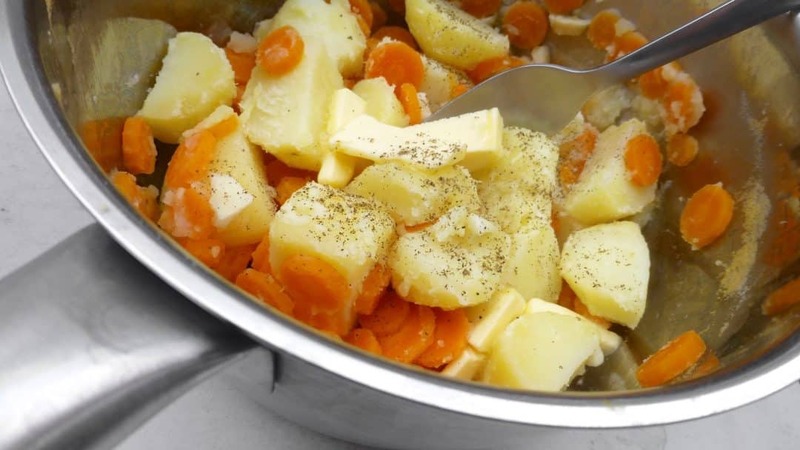 Bring the carrots and milk to a gentle simmer and cook for 6 to 8 minutes until soft. 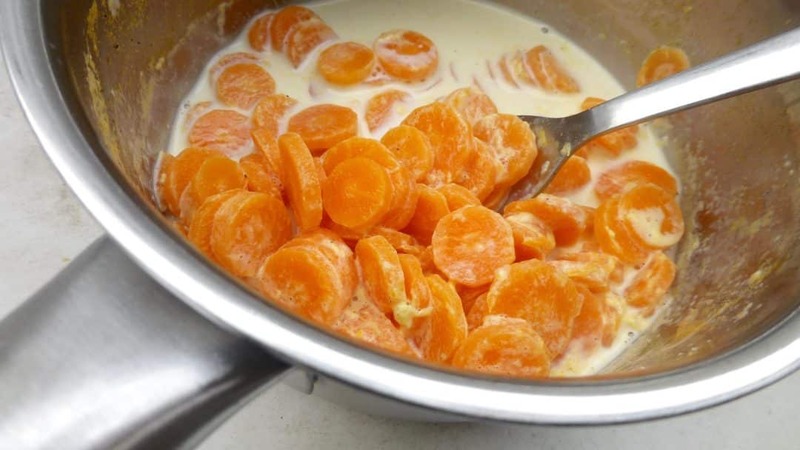 Remove the cooked carrots (keep the milk aside for later) using a slotted spoon and add them to a blender. Also add the grated ginger and a pinch of pepper, nutmeg and salt. Blend into a fine puree. 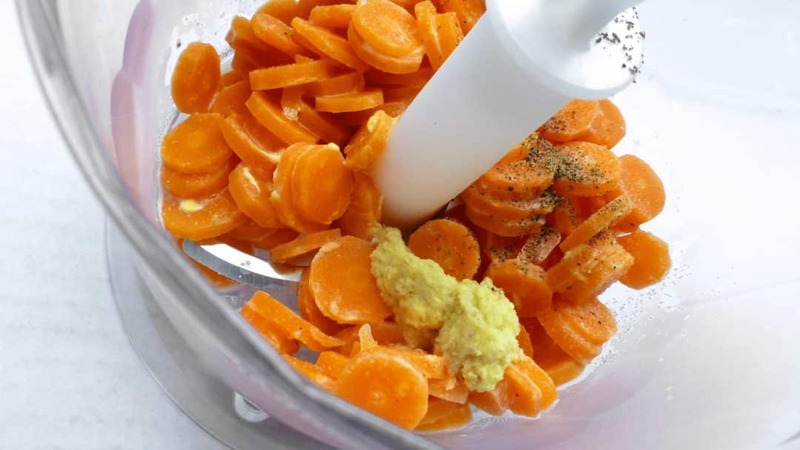 Then drain the cooked carrots and potatoes and transfer them to the bowl of the Stand Mixer Mini. Also add the pureed carrots, butter and a splash of the warm carrot milk you kept aside earlier on. Season with a pinch of pepper, nutmeg and salt. Attach the wire whip and select speed 4. Mix the ingredients for 2 minutes. Then check the seasoning of the mash and add extra pepper, salt, nutmeg or butter to taste. Add extra milk if you find the mash too dry. Scoop the carrot mash onto warm plates and serve hot.